Thank you Debi, I’m gonna check that out! I made my own journal too! : ) I sewed mine. Your cover and the other page are interesting. Reminds me of outer space. Thanks, C. No bubbles? It reminds me a little of outer space too. Art journaling is so therapeutic! Nice that you made your own. Thanks, Beverly! I’m still going to keep my other one, but it wanted something with nicer paper for plein air work. Yay, I hope you do, Squid! Yay, I hope you do! It was so easy to make. Looking forward to your birds! Thanks for sharing Cathy’s video with us. I can’t wait to try it. It’s so easy, you’ll love it! Thanks for the reminder about bird day tomorrow. If I remember do do one today, I’ll post it, otherwise I might have to share another oldie (going with my current theme of sharing old stuff…hah). Old is still good! I love Cathy too. I have several of her books. I like her ways of simplifying things. I think I prefer the second one. Just because it’s very calming to look at. I think that’s why I prefer it! Love your circles, make me smile! 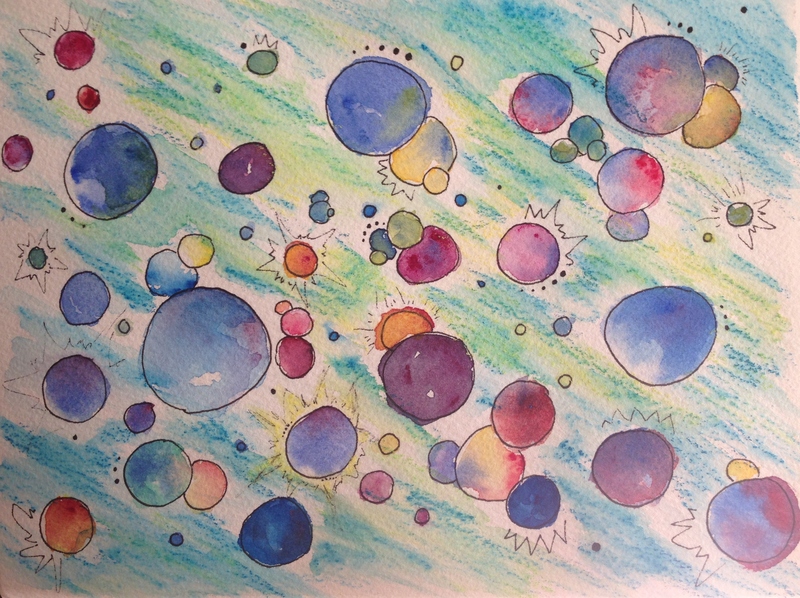 Colorful with movement….and homemade journals rock!!! Love your circles. Cathy Johnson has some neat videos. I have made a number of her folding sketchbooks. They are fun to use. Looking forward to seeing your fall colors. Nice creativity Laura, I like he top one for the energy in the piece! Yay, looking forward to it, Jill! 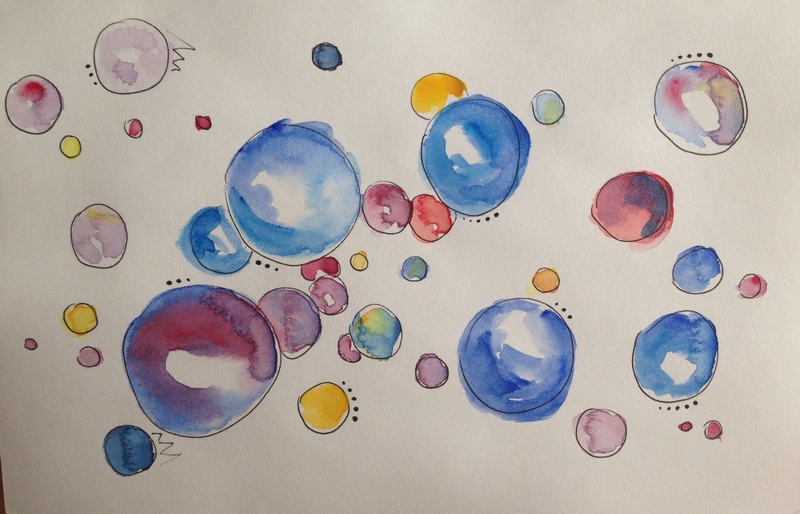 😀 Thanks for your feedback re: the bubble paintings too. I do quite like the background on the first one, but I think the second one (plain background) has better bubbles – they look more “bubbly” if that makes sense… keep up the good work! I like them both, but think the bubbles are better in the one without a background. Nice job!! Love both pieces, each has a unique feel. Thank you for sharing the video, sounds like a definite future project of fun. Peace. Thanks, Kerfe. I think circles may be my thing for awhile. Cool and more refreshing sounds good to me too, Margaret! 😀 Thanks!